I have new shoes for Kung Fu. 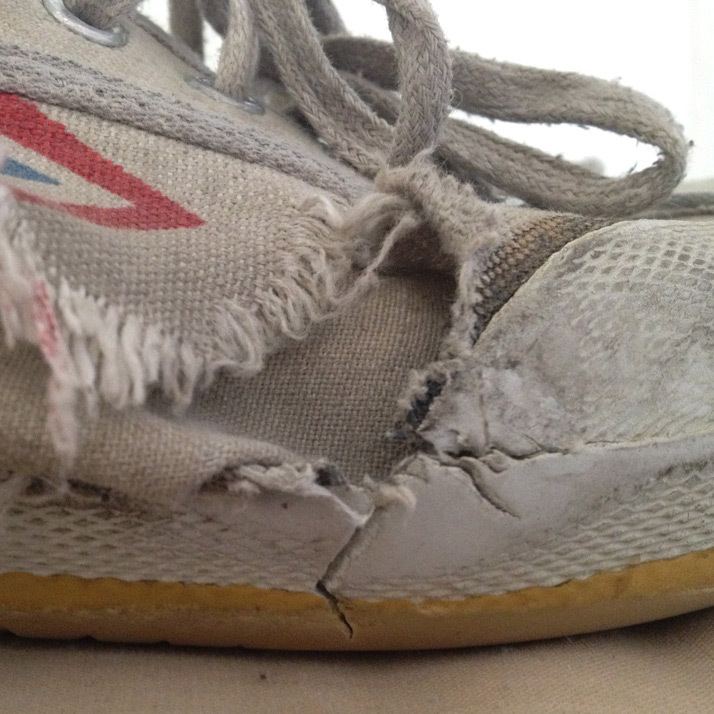 So this is a... meditation, on my old shoes. As you can see, the brand name of the shoe is WARRIOR, which is quite fitting because in Kung Fu, well we're not combing our hair for an hour and a half... And one of the first things that goes on these shoes is the R at the end - so any self-respecting Kung Fu student is going to be wearing WARRIOs, not WARRIORs. You wear WARRIORs it means you don't have your chops. So these various testaments that you see in the photos below are the result of 3 years of Kung Fu classes, twice a week. 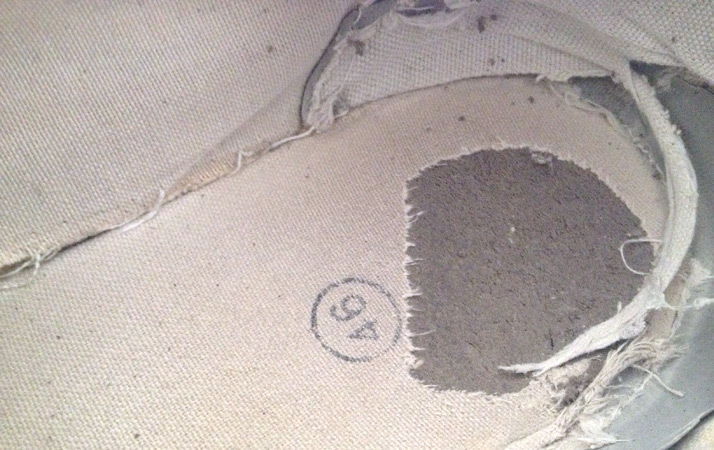 Obviously the inside soles have worn thin - the canvas fabric has simply worn away to show compacted cardboard underneath. The canvas of the shoe upper has worn and frayed and finally surrendered all along each outer side. The toe looks like I have tried to rub it out. The laces have disintegrated around the first set of eyes, and have simply been tied back together, and the first set of eyes are scratched. How? you might ask How? How did you manage to scratch the first set of eyes, 'cause you see they are on the UPPER side of the shoe? See? 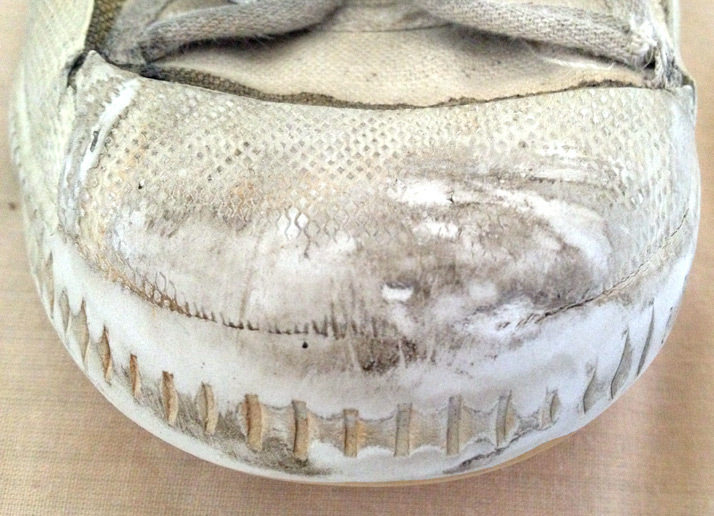 Sure: the soles are scuffed and scratched - but the eyes? WTF? Well the simple answer is "knuckle-drags" - I'm not sure if it's hyphenated: you don't stop to think if it is when you doing them. So you know you did wheelbarrow races when you were a kid - and you laughed so, and you tumbled on the grass? So we do those, and then we do them without the other guy holding your legs, and you make fists and use those to do the dragging instead of the infinitely more suitable palms that you have at your disposal. And we don't laugh and tumble on the grass: We scratch the first set of eyes on our shoes on the concrete. We also wear our shoe-laces thin, and we make the toe covering look like it has been rubbed out.